In order to determine if a company's debt load is over burdensome, investors often use interest coverage ratios. One such ratio is found by dividing operating income by interest due, in order to determine how easily the company is able to meet its interest requirements. 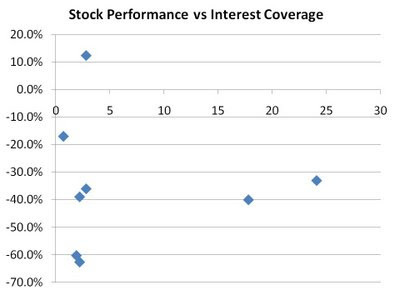 However, investors must keep in mind that interest coverage ratios only demonstrate what has occurred in the past. Therefore, it's imperative to consider such information only when simultaneously considering what may occur in the future. Clearly, relying on interest coverage data has the limitation that none of the information is forward looking. Investors who do not consider more than past data are doomed to fall into traps from which recovery is very difficult. 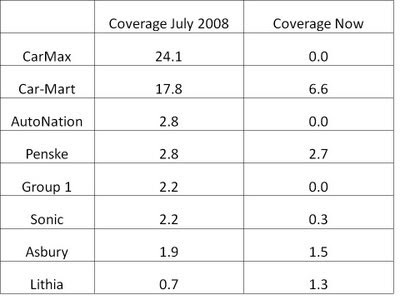 Notice how one company's interest coverage actually improved despite the dire economic circumstances in this industry! We'll explore why in a future post.